Jazz composer/saxophonist Wayne Shorter wrote a piece entitled “Footprints” that within its original instrumental structure conveyed volumes about the dual weight and gravity of upholding lineage and legacy. 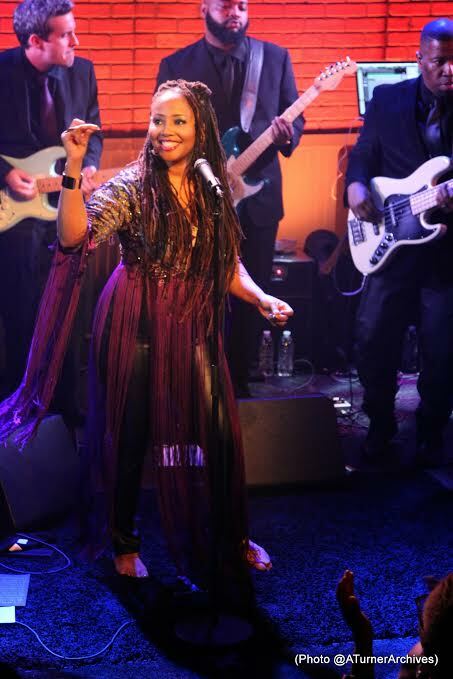 On a cool Tuesday evening in West Hollywood over the course of two shows, singer/songwriter Lalah Hathaway proudly upheld her end of the genealogical bargain in highly anticipated concerts steeped in the Black Pool of music history. Not only was she performing at The Troubadour nightclub – ground zero for where her father Donny Hathaway recorded the most thrilling half of a “Live” LP 43 years prior in August of `71 – she was recording her shows for CD and DVD, too. This is high hallowed territory for not only is Donny Hathaway Live (Atco 33-386 – 1972) arguably the greatest live album of all time, it is the greatest album of all time. A second volume titled In Performance was released 8 years later containing as many gems as the first. Lalah’s concerts marked career and life milestones stemming from her biological anointing as a phenomenal vocalist – genes-kissed by her father Donny and trained by her mother of operatic excellence, Ms. Eulaulah Hathaway, at home, and buffed to perfection at the Berklee College of Music in Boston. She then released to the world a mere 5 solo albums in 25 years, a classic collaboration with jazz piano legend Joe Sample plus guest recordings and performances with scores of grateful artists ranging from Marcus Miller and Grover Washington Jr. to Donald Lawrence, Eric Roberson and two Grammy-winning collaborations with the eclectic collectives Snarky Puppy and The Robert Glasper Experiment. Suffice it to say, local musicologists, longtime fans and kindred celebrities were in loving abundance, chests puffed out on-swole for being present to witness history in the making. Though the club was far from sold out (likely due to being held the first Tuesday “school night” post-tax day and the $100 ticket price), it was a room full of love, including PledgeMusic supporters, which was infinitely more apropos. Lip-glossed, lid-glittered and hair-twisted, Lalah ascended the stage to bluesy electric piano chords and a warm wave of applause. Decked out in a hippy chic `fit of black leather pants splashed with a purple rain of sashes and fringe, and a top pegged by my lovely date Wendy as Moroccan Peacock, barefoot Hathaway tuned her spirit to the room’s rock-n-roll history yet in a manner befitting her own soulful style and pedigree. Diving right into the family jewels, Lalah opened with “Little Ghetto Boy,” a song made famous by her father (penned by his conga player Earl DeRouen with Charles Howard for a film soundtrack Hathaway scored, “Come Back Charleston Blue” – a live version was the single from Donny Hathaway Live). Lalah’s resonant contralto nailed the bass register of the opening line, sending chills. The gritty verses are the proverbial “as relevant today as they were when written,” querying young Black and Latino males what they intend to make of their futures. That it concludes with the rousing chorus “everything has got to get better” illuminates the hope that all affected struggle to feel today in the wake of so much senseless, piled-on adversity. It was a meaningful way to begin this second set. That it was followed by “You Were Meant For Me,” the final solo single released in Donny’s lifetime (Atco – 1978) and rerecorded by Lalah on her most recent solo CD Where It All Begins (Stax – 2011) made for a powerful and poignant one-two punch. When Donny recorded his live album in the early 70s, he only had two solo studio albums and a couple of singles with singer June Conquest out prior. Neither the soundtrack for “Charleston Blue” nor his first classic LP of duets with Roberta Flack had been released [though Donny recorded “Little Ghetto Boy (Live)” and “You’ve Got a Friend” in the live sessions prior to his version w/ Flack). Conversely, Lalah had recorded all of the previously acknowledged albums and collaborations released prior to her shows providing quite a dilemma of what to perform for fans this night. With the inevitable certainty of not being able to please all, Lalah dipped a toe into every solo CD, key collabos plus her two Grammy-winners in a show that lasted just over two hours. Backed by a 7-piece band (2 guitars, 2 keys, bass, drums and percussion) and 3 backing vocalists, Lalah slow burned through fan favorites such as ‘Angela Winbush’s sing-a-long comfort woman anthem “Baby Don’t Cry,” the hypnotic sensuality of “I’m Coming Back” (songwriter Gary Taylor was in the house), the bouncy “Back Then” and the life-affirming “Breathe.” With it being stressed upfront by her opening act DJ Spark and by the Sirius XM host that brought her to the stage, there was zero-tolerance for camera phones and recording devices. Beyond the obvious professional considerations, this was another “gift” from Lalah, as if to say, “sit back, let the pros do the documenting, and simply lose yourself in the moment and the music like “back in the day.” There was much to marinate in. Hathaway appeared confident and comfortable in this shining moment, buoyed by the adoring audience and looking Heaven-ward often, acknowledging and connecting with the spirit of her father. Only one glitch from the keyboard section on the intro to “A Song For You” rattled her cool when she grimaced and looked over to her bass player who shook his head in a gentle brotherly manner, signaling to “shake it off and move on.” Father Donny’s rendition of the Leon Russell classic remains among his most beloved by fans around the world. Though the tempo was regrettably a hair fast here, Lalah sang it exquisitely, echoing her father’s exact tone in spots – heart-stopping to witness. Of the many all-star and tribute projects Lalah has graced, the most moving was a decade ago on Forever, For Always, For Luther (GRP/Verve – 2004) on which she wrapped her soul around the late, lamented Luther Vandross’ sumptuous ballad “Forever, For Always, For Love.” Comically, she had to re-cue the intro three times as the audience whooped and hollered over the opening line. “Oh, is this your song,” she said fixing the audience with a good-natured look? When they finally allowed her to proceed, Lalah melted the very essence of the song like hot fudge over Häagen-Dazs, milking the slow-tempo classic like milk chocolate over marshmallows. This song also provided the instrumental highlight of the evening when guitarist Errol Cooney broke us off with a wickedly modulated solo that started with sparse blues stings played back in the cut to a bonfire of soul-rock fury for which Lalah gladly stepped aside and let him take center stage. This was significant because Donny Hathaway Live was full of showcases for his musicians. I imagine Donny and guitarist Cornell Dupree (immortalized on Side 2 of Donny Hathaway Live, recorded at The Bitter End in New York) were both smiling down on Cooney’s contribution. This writer has had the pleasure of seeing Lalah Hathaway perform live on many varied occasions and in many varied locales. But there have only been two occasions when I’ve seen her sit down and accompany herself at the Fender Rhodes electric piano. The first was at UCLA’s Royce Hall. The second was this night where she returned for an encore singing her introspective composition, “Boston.” It was an intimate cap to a magical, historical evening. The masterful Donny Hathaway and his band brought fervor to The Troubadour stage that remains unmatched – a perfect storm of preparation and perspiration. 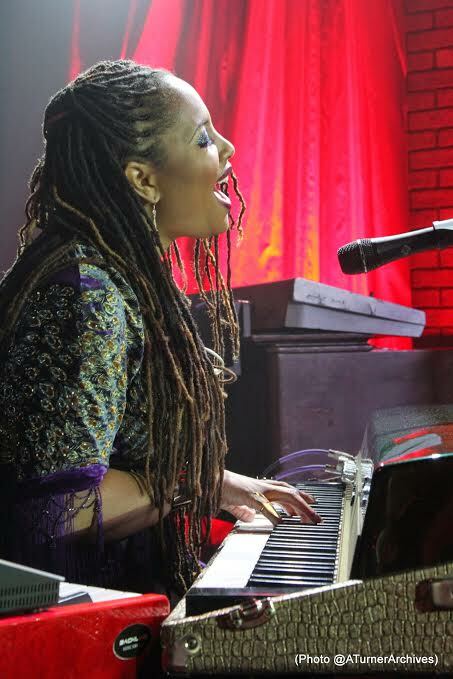 In contrast, Lalah brings a decidedly more controlled and precise presentation – also penetrating and awe-inspiring – yet within a performance context I intuit is as influenced by her mother’s classical training as it is the gospel, blues, soul and jazz essence that were the basis of her father’s thoroughly studied gifts and genius. To experience Lalah live is to watch a woman in full-command of her inner instrument, exacting what she needs and desires at will as the literal and figurative footprints she pads morph more and more into her own with each passing year. 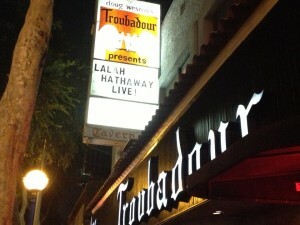 2 Responses to "Footprints: Lalah Hathaway Live at The Troubadour, April 21, 2015"
I love Lalah and each time I am blessed to see or hear her perform, I marvel at her gifts. DONNY HATHAWAY is such a treasure to life and I miss him beyond words…..what a joy that Ms. Eulaulah and Donny’s gifts have been nurtured in her. I am anxiously awaiting the vinyl version of this performance.